When I was growing up in the 1970s, Sri Lanka’s media landscape was very different. We had only one radio station (state-owned SLBC) and three newspaper houses (Lake House, Times of Ceylon and Independent Newspapers). There was no TV, and the web wasn’t even invented. At that time, most discussions on media freedom and reforms centred around how to contain the overbearing state – which was a key publisher, as well as the sole broadcaster, dominant advertiser and media regulator, all rolled into one. Four decades on, the state still looms large on our media landscape, but there are many more players. The number of media companies, organisations and products has steadily increased, especially after private sector participation in broadcasting was allowed in 1992. More does not necessarily mean better, however. Media researchers and advocacy groups lament that broadcast diversification has not led to a corresponding rise in media pluralism – not just in terms of media ownership and content, but also in how the media reflects diversity of public opinion, particularly of those living on the margins of society. 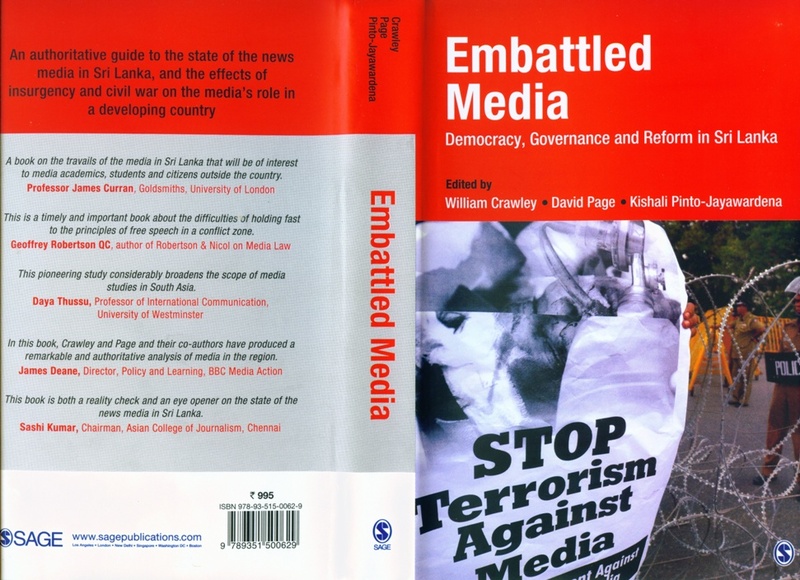 The multi-author book, titled Embattled Media: Democracy, Governance and Reform in Sri Lanka (Sage Publications, Feb 2015), was compiled during 2012-14 by a group of researchers and activists who aspired for a freer and more responsible media. It came out just weeks after the last Presidential Election, where media freedom and reforms were a key campaigning issue. The book, to which I have contributed a chapter on new media, traces the evolution mass media in post-colonial Sri Lanka, with focus on the relevant policies and laws, and on journalism education. It discusses how the civil war continues to cast “a long shadow” on our media. Breaking free from that legacy is one of many challenges confronting the media industry today. Some progress has been made since the Presidential election. The new government has taken steps to end threats against media organisations and journalists, and started or resumed criminal investigations on some past atrocities. Political websites that were arbitrarily blocked from are once again accessible. Journalists who went into exile to save their lives have started returning. On the law-making front, meanwhile, the 19th Amendment to the Constitution recognized the right to information as a fundamental right. But the long-awaited Right to Information Bill could not be adopted before Parliament’s dissolution. Thus much more remains to be done. For this, a clear set of priorities has been identified through recent consultative processes that involved media owners, practitioners, researchers, advocacy groups and trainers. These discussions culminated with the National Summit on Media Reforms organised by the Ministry of Media, the University of Colombo, Sri Lanka Press Institute (SLPI) and International Media Support (IMS), and held in Colombo on 13 and 14 May. Parallel to this, there were two international missions to Sri Lanka (in March and May) by representatives of leading organisations like Article 19, UNESCO and the International Federation of Journalists (IFJ). I served as secretary to the May mission that met a range of political and media leaders in Colombo and Jaffna. We can only hope that the next Parliament, to be elected at the August 17 general election, would take up the policy and law related aspects of the media reform agenda (while the media industry and profession tackles issues like capacity building and greater professionalism, and the education system works to enhance media literacy of everyone). Pursuing these reforms needs both political commitment and persistent advocacy efforts. Right to Information: The new Parliament should pass, on a priority basis, the Right to Information Bill that was finalised in May 2015 with inputs from media and civil society groups. Media Self-Regulation: The Press Council Act 5 of 1973, which created a quasi-judicial entity called the Press Council with draconian powers to punish journalists, should be abolished. Instead, the self-regulatory body established in 2003, known as the Press Complaints Commission of Sri Lanka (PCCSL), should be strengthened. Ideally its scope should expand to cover the broadcast media as well. Law Review and Revision: Some civil and criminal laws pose various restrictions to media freedom. These include the Official Secrets Act and sedition laws (both relics of the colonial era) and the draconian Prevention of Terrorism Act that has outlived the civil war. There are also needlessly rigid laws covering contempt of court and Parliamentary privileges, which don’t suit a mature democracy. All these need review and revision to bring them into line with international standards regarding freedom of expression. Broadcast regulation: Our radio and TV industries have expanded many times during the past quarter century within an ad hoc legal framework. This has led to various anomalies and the gross mismanagement of the electromagnetic spectrum, a finite public property. Sri Lanka urgently needs a comprehensive law on broadcasting. Among other things, it should provide for an independent body to regulate broadcasting in the public interest, more equitable and efficient allocation of frequencies, and a three-tier system of broadcasting which recognises public, commercial and community broadcasters. All broadcasters – riding on the public owned airwaves — should have a legal obligation be balanced and impartial in coverage of politics and other matters of public concern. Restructuring State Broadcasters: The three state broadcasters – the Sri Lanka Rupavahini Corporation (SLRC), the Sri Lanka Broadcasting Corporation (SLBC) and the Independent Television Network (ITN) – should be transformed into independent public service broadcasters. There should be legal provisions to ensure their editorial independence, and a clear mandate to serve the public (and not the political parties in office). To make them less dependent on the market, they should be given some public funding but in ways that don’t make them beholden to politicians or officials. Reforming Lake House: Associated Newspapers of Ceylon Limited or Lake House was nationalised in 1973 to ‘broadbase’ its ownership. Instead, it has remained as a propaganda mill of successive ruling parties. Democratic governments committed to good governance should not be running newspaper houses. To redeem Lake House after more than four decades of state abuse, it needs to operate independently of government and regain editorial freedom. A public consultation should determine the most appropriate way forward and the best business model. Preventing Censorship: No prior censorship should be imposed on the media. Where necessary, courts may review media content for their legality after publication (on an urgent basis). Laws and regulations that permit censorship should be reviewed and amended. We must revisit the Public Performance Ordinance, which empowers a state body to pre-approve all feature films and drama productions. Blocking of Websites: Ensuring internet freedoms is far more important than setting up free public WiFi services. There should be no attempts to limit online content and social media activities contravening fundamental freedoms guaranteed by the Constitution and international conventions. Restrictions on any illegal content may be imposed only through the courts (and not via unwritten orders given by the telecom regulator). There should be a public list of all websites blocked through such judicial sanction. Privacy and Surveillance: The state should protect the privacy of all citizens. There should be strict limits to the state’s surveillance of private individuals’ and private entities’ telephone conversations, emails and other electronic communications. In exceptional situations (e.g. crime investigations), such surveillance should only be permitted with judicial oversight and according to a clear set of guidelines. While all these are forward looking steps, the media industry as a whole also needs state assistance to exorcise demons of the recent past — when against journalists and ‘censorship by murder’ reached unprecedented levels. Not a single perpetrator has been punished by law todate. This is why media rights groups advocate an independent Commission of Inquiry should be created with a mandate and adequate powers to investigate killings and disappearances of journalists and attacks on media organisations. Ideally, it should cover the entire duration of the war, as well as the post-war years. News wrapped in laughter: Is this the future of current affairs journalism? Who can follow these footsteps? “What matters about Cronkite is that he knew when to stop being reassuring Uncle Walter and to challenge those who betrayed his audience’s trust. He had the guts to confront not only those in power but his own bosses. Given the American press’s catastrophe of our own day — its failure to unmask and often even to question the White House propaganda campaign that plunged us into Iraq — these attributes are as timely as ever. I cannot agree more with the premise and arguments in this essay, which is well worth a careful, slow read by everyone, everywhere who cares for good journalism — either as practitioners or consumers (and in this media saturated age, don’t we all fall into one or both categories?). At the same time, without detracting from the value of — and the crying need for — investigative, reflective and ‘serious’ journalism, I believe comedy and especially political satire play a key role today in analysing and critiquing politicians, businessmen and others whose decisions and actions impact public policy and public life. Political satire is nothing new: it’s been around for as long as organised government. Over the centuries, it has manifested in many oral, literary or theatrical traditions, some more memorable and enduring – such as Gulliver’s Travels and Animal Farm. And for over a century, political cartoonists have been doing it with brilliant economy of words – as I have said more than once on this blog, they are among the finest social philosophers of our times. In the age of electronic media, it’s only natural that the tradition of satire thrives on the airwaves and online. In fact, there is a rich and diverse offering of politically sensitive and/or active satire in the mainstream and online media that we can consider it a genre of its own. Some of it is so clever, authentic and appealing that we might momentarily forget that we are experiencing a work of satire. Purists might decry this blurring of traditional demarcations between information, commentary and entertainment — but does that really matter? When we survey the media and cultural scenes in our globalised world, we see things getting hopelessly entangled and mixed up everywhere. Nothing is quite what they seem – or claim – to be anymore. Content that is explicitly labelled as pure news and current affairs is looking more and more like entertainment. My friend Kunda Dixit, who edits the Nepali Times, says this is inevitable when the same mega corporations own both cartoon networks and news channels. No news is good news -- for whom? If the mainstream news organisations don’t quite live up to our expectations to gather, analyse and reflect on the current affairs of the day, we should at least be grateful that some comedians are stepping into that void. We must welcome, celebrate and wish their tribe would increase! The rise and rise of political satire is also being chronicled and analysed. A new book tells us why we now have to take satire TV seriously — it turns out to be the bearer of the democratic spirit for the post-broadcast age. Titled Satire TV: Politics and Comedy in the Post-Network Era, the book is co-edited by Jonathan Gray, Jeffrey Jones and Ethan Thompson (NYU Press, April 2009). Let me summarise the news so far. Intentionally or otherwise, some news anchors and politicians are increasingly behaving like comedians. Meanwhile, a few professional comedians are talking serious politics and current affairs in a genre of media that is growing in popularity by the day. Are you confused yet? Well, get used to it. This is the shape of things to come. In such topsy-turvy times, we need more Jon Stewarts to puncture the bloated egos and images of not only elected and other public officials, but also of our larger-than-life news anchors, editors and media tycoons. I would any day have conscientious comedians doubling as social and political commentators than suffer shallow, glib newscasters trying to be entertainers. That’s what you call laughing for a good cause. 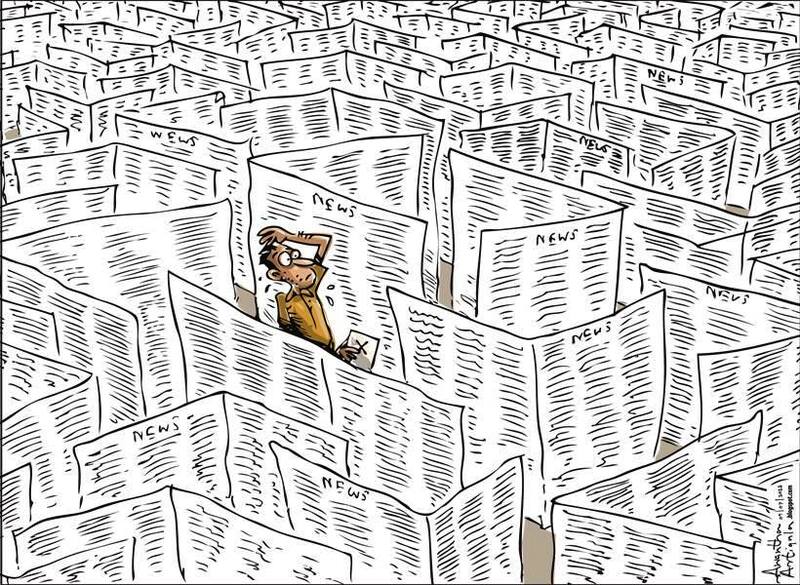 Parting thought: There is another dimension to satirising the news in immature democracies as well as in outright autocracies where media freedoms are suppressed or denied. When open dissent is akin to signing your own death warrant, and investigative journalists risk their lives on a daily basis, satire and comedy becomes an important, creative – and often the only – way to comment on matters of public interest. It’s how public-spirited journalists and their courageous publishers get around draconian laws, stifling regulations and trigger-happy goon squads. This is precisely what is happening right now in countries like Kenya and Sri Lanka, and it’s certainly no laughing matter. More about this soon. The show premiered in July 1996, and was initially hosted by Craig Kilborn. Jon Stewart took over as host in January 1999, and made it more strongly focused on politics. In each show, anchorman Jon Stewart and his team of correspondents, comment on the day’s stories, employing actual news footage, taped field pieces, in-studio guests and on-the-spot coverage of important news events. OK, The Daily Show may not be intentionally serious journalism, anymore than mainstream news channels are intentionally funny. But a significant number of American TV viewers and TV critics, as well as media researchers, have found the analysis and commentary to be highly insightful and incisive. It has won many awards including an Emmy and Peabody Award. It’s been on the cover of Newsweek for its outstanding elections coverage and serious journalism. It’s not to be laughed off easily.